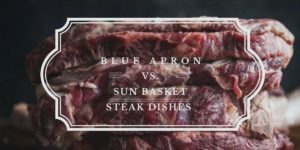 In a fast-paced world where everyone’s busy and no one seems to have time, eating healthy and making home-cooked meals can turn into a rare occasion. The solution: choosing ready cooked, healthy meal recipes and ingredients delivered to your doorstep. If you love chicken meals, Home Chef is a safe bet. With the highest rate of customer satisfaction, they offer many delicious chicken dishes every week for you to choose from. Out of their total 16 menu options, most weeks they have at least 5 chicken meals. With so many varieties of food to choose from, you won’t want to miss out on any of the best. To give you a head start, these 5 dishes should be on the top of your “must try” list. Plus, with a menu that’s being updated by the week, you won’t ever get bored with the options you’re given. If you’re the slightest bit unsure of how good the Home Chef chicken menu might be, then take a look at these 5 amazing recipes. 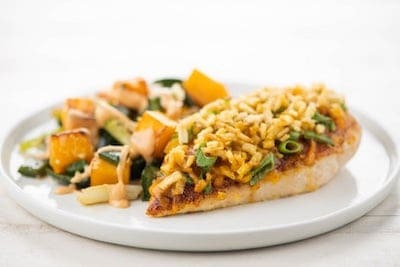 The Cheddar and Crispy Potato Crusted Chicken is the perfect example of a traditional yet delicious meal that Home Chef has managed to put the perfect creative spin on. The chicken crusted with potato sticks and topped with parmesan cheese, all accompanied by roasted vegetables as a fresh side. In addition to the veggies, the other side dishes include grilled butternut squash, poblanos, and green onion. Such a detailed and delicious meal might sound hard to make, but with the help of Home Chef, only takes about 30 minutes. Unique and easy to cook, the Chicken Poblano Peppers from Home Chef is one of the absolute best options on the menu in terms of taste and convenience. Fresh corn and tomatoes are stuffed into the chicken filling, which combines perfectly with the poblano peppers. The dish is finished by the sour cream sauce, and tortilla chips make for the perfect side. 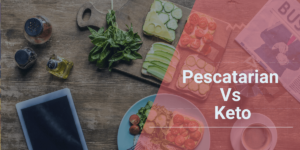 Plus, with only 600 calories per saving, this pepper dish is one of Home Chef’s tastiest and healthiest entrees. 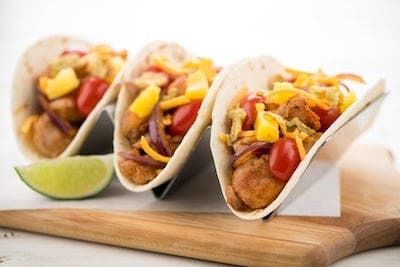 The Hawaiian Chicken Thigh Tacos from Home Chef is the perfect combination of sweet, spicy, and seasoned chicken flavors. The addition of tomatoes and pineapples give the tacos a tropical taste that will take your taste buds to heaven. Salsa for the tacos is made of pineapples, lime, tomatoes, salt and pepper, which gives the tacos its finishing touch along with some jalapenos. 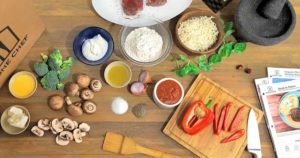 With very few ingredients needed and a clear step by step recipe card, this meal is fun to make and even more fun to eat. One-Pot Creamy Chicken Chowder is easily one of Home Chef’s best soups. Made up of diced and seared chicken, sweet corn, poblano, and left to simmer in cream results in a chowder that’s irresistible. The poblano pepper along with onions and lime give it a festive taste that anyone would love, while the seared chicken and creamy soup gives it texture and juicy thickness. The seasoning of this dish goes far beyond its simple ingredients, giving it a taste you’ll always remember. Finally, adding sprinkling with cheese and topping with tortilla chips completes this dazzling chowder. 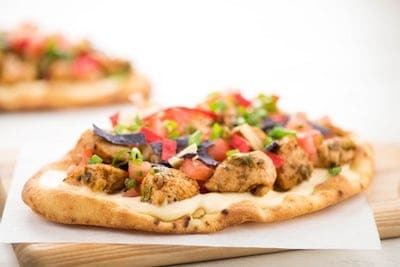 This recipe from Home Chef resembles the crunchiness of nachos combined with the sharp taste of cheese, all on a beautifully toasted flatbread. 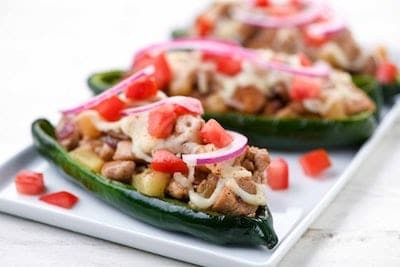 The chicken serves as a magnificent topping along with a jalapeno salsa to give the finishing touch. Preparing the salsa, ingredients, and throwing it all together only takes 25-30 minutes, perfect for any busy person. Not only is it quick to fix, but healthy to eat. Not only does Home Chef offer healthy and nutritious recipes, but also the best tasting meals you’ll ever try. Food doesn’t have to be unhealthy to be convenient, and these meals can prove it to you. If you’re a chicken lover, then Home Chef is a must-try meal kit company.